Sermons provide a congregation with the opportunity to listen to and learn from a pastor’s or lay pastor’s reflection and teaching based upon scripture. Here you can listen to past sermons preached by our pastor, Jon Fancher, or by a visiting or lay pastor. Whether you are listening to a sermon for the first time or listening to it again with deeper appreciation, we welcome you to this virtual worship experience. Printed versions of RRPC sermons are also always available in the church lobby for reading or sharing with friends. Are you looking for a sermon from a particular person or sermons from a particular series such as the 2015 Advent season? Click on the [Show filter] link to display the options to filter the sermons to what you are looking for today. Preacher: Dr. K. Dean Myers (1), Rev. Lois Annich (1), Melissa Stickney (1), Dr. Richard G Watts (1), Lisa Watts (1), Marc Hustek (1). Book: Psalm (3), Mark (1), John (3), Romans (1), Ephesians (1), Colossians (1). Mark 14:3-9 (Part of the 2015 Visitors Sermons series). 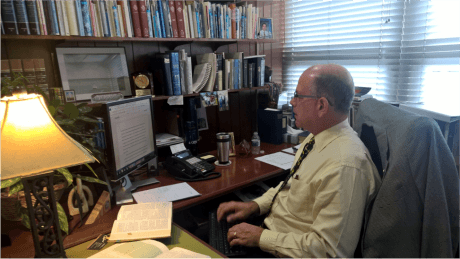 Preached by Dr. K. Dean Myers on August 9, 2015 (Sunday Morning). John 6:24-35 (Part of the 2015 Visitors Sermons series). Preached by Rev. Lois Annich on August 2, 2015 (Sunday Morning). John 6:1-21 (Part of the 2015 Visitors Sermons series). Preached by Melissa Stickney on July 26, 2015 (Sunday Morning). Romans 12:9-18 (Part of the 2015 Visitors Sermons series). Preached by Dr. Richard G Watts on July 12, 2015 (Sunday Morning). Psalm 23:1-6 (Part of the 2015 Visitors Sermons series). Preached by Lisa Watts on April 26, 2015 (Sunday Morning). Psalm 133:1-3 (Part of the 2015 Visitors Sermons series). Preached by Marc Hustek on January 18, 2015 (Sunday Morning). Church school available for all children and youth through grade 6. Nursery care for children under two. Kids in Sunday Service on the first Sunday of each month, with classes for children 5 and younger.